Rub 150g butter into 200g self-raising flour. Stir in 100g light muscovado sugar, 2 tsp mixed spice and 2 Russet apples, peeled, cored and thinly sliced. Stir in 2 medium eggs, beaten, and 3 tbsp of milk to make a soft consistency. 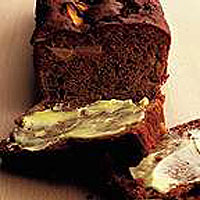 Pour into a buttered and base-lined 1kg loaf tin, smooth top and sprinkle with Waitrose Demerara Sugar. Bake in a preheated oven 180°C, gas mark 4, for 40-45 minutes, until risen and firm. Cool for 5 minutes then turn out. Serve warm or cold with custard or cream. Or cool and butter for afternoon tea. Delicious with crumbly cheese.